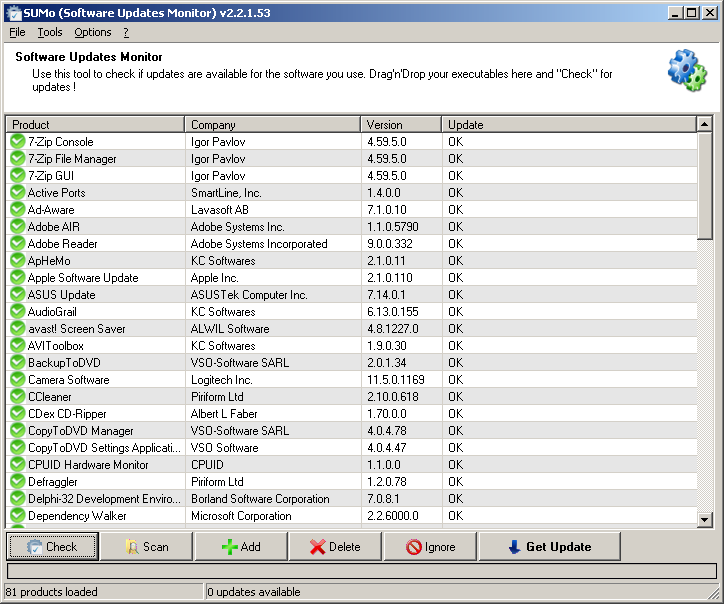 SUMo, which stands for Software Update Monitor. SUMo passively scans various online servers for updates pertaining to any installed computer software you may have. It does this by automatically detecting all software installed on your machine and then searching online for various updates or patches that may be available. This means that your system can remain in peak operating performance at all times without needing to worry about manually updating every program that you may have. Qweas is providing links to SUMo 3.4.0.166 as a courtesy, and makes no representations regarding SUMo or any other applications or any information related thereto. Any questions, complaints or claims regarding this application SUMo 3.4.0.166 must be directed to the appropriate software vendor. You may click the publisher link of SUMo on the top of this page to get more details about the vendor.